As much as I love AAA games, it’s the indie games that often stick out to me the most, because they’re the ones who really take chances with a game. Sometimes the chance is a visual design, sometimes it’s a story topic that may be too sensitive or controversial, and sometimes it’s a simple game mechanic. 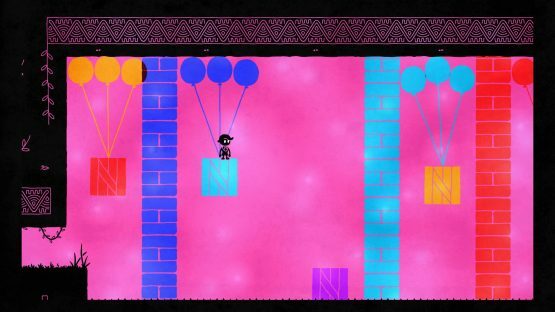 Curve Digital took their chance in using color as a puzzle-solving mechanic. It’s unbelievably simple, and yet this indie team found a way to make something so simple be so incredibly complex. Hue starts off leading players to the water, showing how simple and easy it is to just drink, and then when the player leans over to lap up the water, Hue kicks them in. The player may flap around wildly in an attempt not to drown, but they won’t try to leave, because now they’re hooked. That’s what Hue will do to you, even if you’re like me and loathe platformers with a passion. Hue Is a Bit Off-Color. Hue is about a boy also named Hue, who goes on a mission to restore color that was lost in the world. All he has to go on are letters left behind by his mother, who was researching how to see colors not in our visible spectrum. She created a Color Ring to try to see beyond the spectrum of light, and it broke, and the colors vanished. As a result, she fell into those invisible colors, disappeared from Hue’s sight, and Hue’s world is now a bleak grey. However, as Hue walks around his small fishing village, he (and the player) can’t help but notice that several pathways are blocked off with brightly colored blocks. How in the world can he get past those and find what his mother has tasked him to do? When Hue finds colors for the broken Color Ring his mother left behind, he has the ability to change the environment around him to that particular color. Only black objects are not affected by the Color Ring. So, for instance, if the way is barred by aqua-colored boulders, then Hue can pass through them if he changes the Color Ring to aqua. The aqua boulders blend in with the aqua background, making them absolutely invisible and allowing Hue to pass right through them. Hue can use the same trick when it comes to arranging items in a puzzle room. If he needs to move this purple block on the other side of the yellow one, all he has to do is turn the room yellow and then push the purple block right on through. If your first question was mine, regarding how colorblind people can play, the developers did think of that with a Colorblind Mode. This mode uses symbols to designate colors on the Ring as well as obstacles. Hue starts small, with only one color to manipulate, giving the player a false sense of security. See how easy this is? It’s not so bad, is it? Then the second color is added, then a third, and soon you will have all eight colors of the Ring. And do you think that’s all for you? You find all eight colors and life is happy? If only. No, this is where the true fun begins. The number one issue with puzzle-based games is balancing between keeping the puzzle challenging and yet not frustrating the player. That frustration can come from a puzzle that is too difficult to solve or from gameplay mechanics that are too tricky to master. Hue is able to straddle this balance quite well. The goal of each puzzle is to leave the room for the next puzzle, sort of like Portal, but the puzzle often lies in determining both of what you need to do and how to do it. Sometimes it’s obvious what you need to do, but the challenge lies in how to do it, and sometimes it’s vice versa. As the puzzles slowly ramp up the difficulty, it becomes both. A lot of the puzzles require platforming, which helps if you feel at home with this genre of game. I do not. Platformers are my Kryptonite of gaming, but even so, the gameplay mechanics with jumping and color switching are sound enough that the challenge was rarely with the platforming parts. Now when it was, it was absolute torture for me, but I was always able to get through it once I realized what the solution to each puzzle was. That alone should give hope to any and all players who shy from platformers as much as I do. That said, the execution of color changing isn’t flawless. Several times my death was caused not by my own mistake, of which I admit there were plenty of, but because the color did not change when I know I set the Color Ring to do so. The right analog stick is used to set the color by twirling the stick around the Ring and releasing it on the selected color. Most of the time, it works beautifully. Other times, not so much. It’s often not a big deal early on, but in later puzzles, when your life depends upon changing the color so Hue can make a jump and not die a color-lasered death, a failed color change (not the same as an incorrect color change) can cause a controller to be thrown. That may or may not come from personal experience. In addition to the puzzle-solving, there are opportunities for exploration to collect mysterious beakers of chemicals. You can leave areas when ever you wish and visit past puzzle zones, which is handy when you find all of the colors in the first third of the game. I personally found it a bit cathartic when a room had me completely stuck. Sometimes running around in simpler rooms to find the wayward beakers kicked the brain in gear for a solution. Even though Hue looks very bland, its elegant puzzle craftsmanship proves once again that you most certainly cannot judge a game by its graphics. I can’t imagine how painstaking it was for this team to perfectly balance the growing difficulty with the puzzles, building upon each puzzle learned and amping it up just a smidge. No room was above and beyond more difficult than the one prior; it was slow and steady growth, and one that will keep you glued to your controller until you finish it. Hue review code provided by publisher. For more information on scoring please see our Review Policy here.